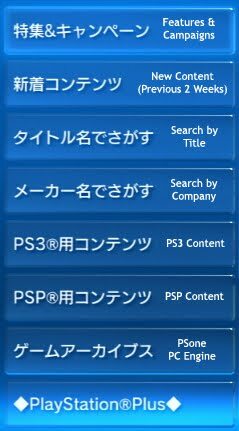 I finally got around to making myself a Japanese PSN account a few months ago, and I have to agree---it's pretty cool. Also, I, too, have noticed quite a few things whose exclusion from the US PSN is completely baffling. For example, Japan got a playable demo for King of Fighters XII---an extremely limited demo, but a demo nonetheless. Surely, this sort of thing might have improved KoFXII's extremely chilly reception in the US? Admittedly, it didn't take me long to throw down some cash to pick up a few things (most notably the PS1 version of Policenauts), though the cost is definitely steep: from Play-Asia, a 1000-yen card costs $16.99, though, given current exchange rates, that's not too bad of a markup; at a Kinokuniya here in California, I just paid $10 for a book with a cover price of 550 yen. 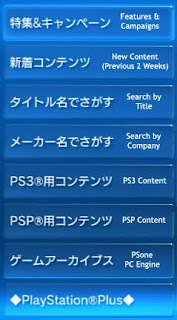 My other favorite thing on the Japanese PSN is the show GameDiggin. It's a series designed to showcase the Game Archives of PS1 and PC-Engine titles available for purchase. The first bunch of episodes are all hosted by Japanese entertainment personality Teppei, accompanied by Araji Yatsuka, who happens to be one of the directors for Famitsu. Every episode consists primarily of the hosts attempting to play the showcased game of the week, accompanied by various special guests from the Japanese game industry. The later episodes all have a brief section in the middle where they give brief summaries of other games similar to the one currently being played (and all conveniently available for purchase on the PSN). All together, there aren't too many episodes, and they're all pretty short, but they're definitely all enjoyable (except for the hideously boring episode showcasing the boxing management sim Boxer's Road). Sadly, there's about 20 demos or so that were once on the store but are now gone. Kenza, Yakuza 3 and Yaluza 4 were all up at one point. So were others! I order my yen codes via ebay. Hell, most time i start up the PS3, it's just to play my various japanese PSX and PCE games.